Ghastly line for me looked like it could have a skull underneth that purple cloak and went from there. When a pokemon dies, with very much anger and vengenance in the heart. Those thoughts would turn into poison and lit the skull of said pokemon alive, trapping it's soul in the skull. The poison would move inside the skull when the pokemon would sleep so only a kranium would lie on the ground. Being the soul, the skull when destroyed can either be the end of the life or if there is pieces left of the skull, then the poison would seep out and try hold on the tiny pieces and parts of the soul. From there you would have Muk. 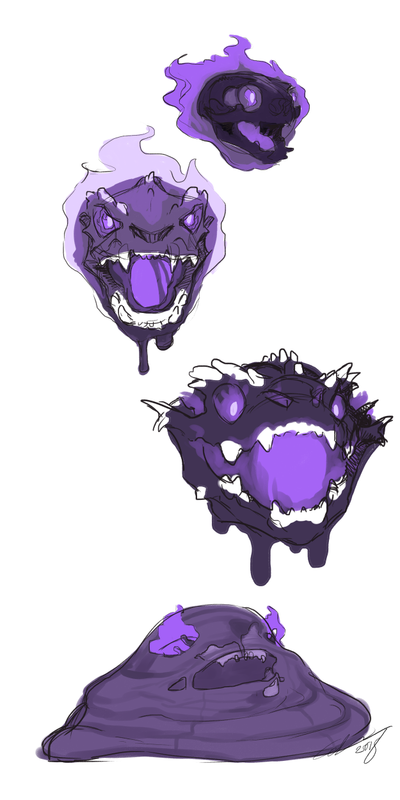 This only works with Ghastly and Haunter stage but not with Gengar since at that stage the poison have been reshaped to a whole new being of shadow as well, the skull not being the only bones in the being. Some gengars are not even a fluid shape holding the bones anymore but a new biologic creature. Some might have the dropping bits feature when using shadow moves and the fiery glow in the eyes. So here in the bottom of the pic, we see a muk, holding the last pieces of it's skull. The body being fully made of poison which is the curse of vengeance and not wanting to rest and firmly holding on to the last piece of the soul as well.